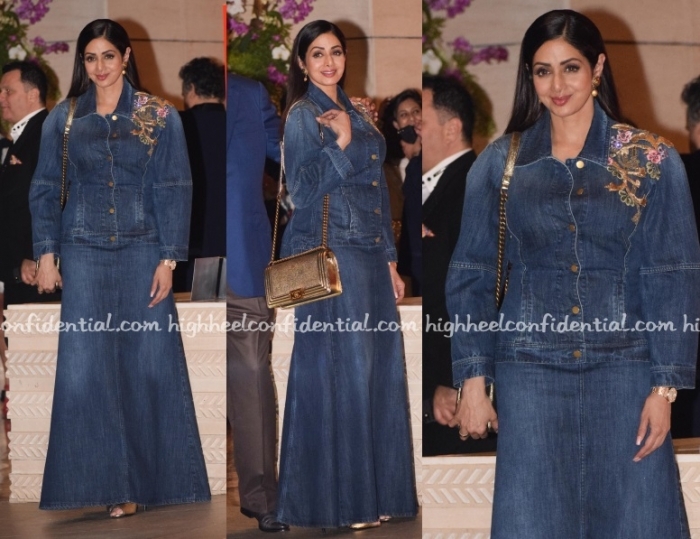 After giving us a fabulous sari appearance on Sunday, Sridevi was spotted in another blue look later in the evening at the Ambani bash in Alberta Ferretti denim separates. I guess it’s the universe’s way of doing a balancing act. How else do you explain this? Because I seriously cannot figure out why she would be drawn to either of the two pieces and worse, wear them together! Girls! You two are so damn funny! Yup! Rolling my eyes up! I feel when she is dressed by a stylist, she stands out but the personal choice doesn’t please! OMFG!!!! THOSE SLEEVES! WTF!?!?!?! MY EYES!!!!!!! Can we just unsee this and delete it from memory ? Imagine that sridevi didn’t wear this denim ensemble to a major formal party ? The fit makes her look stuffy. The skirt I don’t mind but on a shopping trip … the top has no redeeming qualities. Anyway, where is my delete from memory button? The only reasonable explanation is that she spilled something on her original clothes and had to change quickly. How do i unsee it. There has to be a backstory to this outfit, right??!! Did she lose a bet or something ? There were no mirrors anywhere around her for her to see herself in this before she left home. Even then, how come Boney ji or her fashionista duaghters did not alert her? Maybe she is wearing something slinky under all that denim cover up. When many people here comment on Sridevi’s posts saying – She could look great in a sack, or in a trash bag – she must’ve thought, why not give it a try! Yikes, what a terrible fit and just all round ridiculous styling. Maybe all the fawning on these pages has gone to her head. Oh noo why?? Who styled her?!? She looks horrific. She has zero dressing sense. Omg what happened to Sri !!!!!! Two pieces? This monstrosity could be a jumpsuit. This is a public service announcement. Sridevi please do not style yourself without professional help. 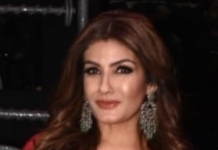 Despite the look…. Look at the confidence…?? Whenyou blindly follow the trends…..denim on denim look! Btw, who wears denim jacket like this? All button up as if it is not a jacket but a shirt! Without all that makeup and gold accessories it would’ve been sister wives territory. Sri: Umm… I am in the mood for denim… what should I wear? The top and skirt both look like something i would pick up at throwaway prices from Janpath / Linking road.. and even my college sense of fashion would balk at pairing the 2 together… totally inappropriate outfit for the event and for her age and status.. utter fail! She looks horrible!! Fashion Disaster!!! OMG…What is this she is wearing? Cannot believe my eyes. Hahahaha, the Canadian Tuxedo is a bad idea for anyone! Makes her look like a NFL line backer. That’s enough of denim to stitch few pairs of jeans. really bad fit makes her look bulky in the most undesirable places. One of the most hideous separates put together by Sridevi for an evening look that too for Ambani bash!! Dress not great, but why do I find her very beautiful here? Her face and neck is gorgeous, probably because the rest of her body is covered, highlighting her radiant face? Wow!! Guess that was one helluva Truth/Dare game huh? !